Pelosi Has a Lot of Problems. This Is The Biggest One. Nancy Pelosi has a problem. No, it’s not the one where she has loose dentures and fumbles with them during the State of the Union. It’s not her vacant stares or incoherent ramblings either. It’s not the fact that her lips don’t move from what I’m guessing is one too many “procedures” at the cosmetic doctor’s office. And it’s not that the only thing her party stands for is hating Donald Trump. It’s none of those. Nancy’s problem is that the symbol of the Democratic Party, the donkey (we’re choosing the kinder word for the animal, here), now has human representation in the form of Alexandria Ocasio-Cortez, and she can’t control her. Oh, there are others: Adam Schiff, Jerrold Nadler, Maxine Waters, Debbie Wasserman-Schultz, Rashida Tlaib, and the loveable anti-Semite Ilhan Omar. The list goes on, but this column can only be so long. All that is necessary to prove this theory is to go to any conservative site and count the headlines with AOC’s photo. Conservatives focus on her for one reason. 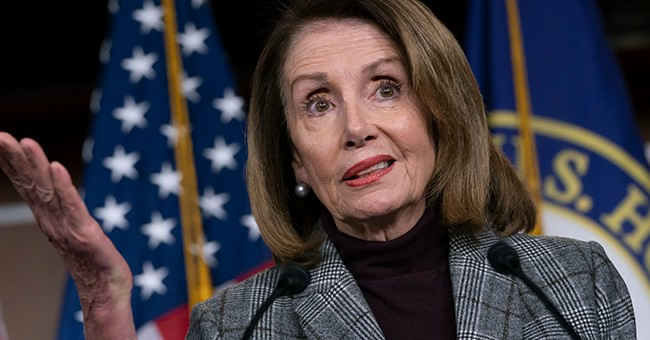 She is now the poster child for the Democrats, whether Nancy Pelosi likes it or not. She is their new national symbol, the donkey 2.0. To list her offenses to math, economics, the English language, civics, and history is piling on at this point, although every day she gives new fodder to those of us who love to point out her complete ignorance on these important topics. For conservatives, she is the best thing we could ever ask for. She spouts every Leftist fantasy with no restraint. Sure, we hated Hillary, but it was for other reasons. We knew she was corrupt and would eventually lead us in the same direction, but she did it all for power and control. AOC, on the other hand, truly believes what she is saying, which makes her far more dangerous because she actually wishes to implement her socialist fantasies. Hillary preferred using issues as hostages to force ransom money (a.k.a. donations to the Clinton Foundation) from corporate America and foreign entities. She used issues to further her power base and extract financial gain via crony capitalism. Maybe it’s a distinction without a difference. Either way, AOC is the cooler, more hip version of what we conservatives love to hate. Sorry Hillary, you’re the old dog and AOC is the new puppy. For the record, it’s not personal. We hate her ideas. We don’t hate her because she is “pretty” or “young.” Her words, not mine. The Left gets it wrong here every time. Same thing with Obama. We didn’t hate him because of his skin color, we hated him because he stood for everything we stand against. AOC might have been a great bartender, but the fact that she is one of 435 people who have incredible influence over our daily lives gives us every reason to call her out at every opportunity. The problem only started with her once she became an elected official. She could spew her Marxist crap all she wanted as long as she was pouring drinks. It might have cost her a tip, but no one cared who she was or what she believed when she was mixing margaritas. Now that she serves on the Committee on Financial Services, which has the ability to influence our national financial system to the point of possibly collapsing it, we have good reasons for our concerns. If mocking her colossal ignorance on matters of everything outside of pop culture helps shine a light on her inability to govern then so be it. Since her emergence onto the national stage, I have struggled determining whether AOC is dangerously ignorant or just painfully stupid. It could just be different sides of the same coin. A coin might even be a bad example. After all, a coin has transferable value. She’s more like a car wash token, only redeemable in certain locations. The AOC coin works in part of Queens, the Bronx, and on or near university campuses, but not in the rest of the continental United States. To Nancy Pelosi she’s that car wash token you have in your pocket when you’re at the vending machine in desperate need of some breath mints. In a purely political sense, AOC is like the cute little puppy that grows up into a problem dog. In Nancy’s House, the kids brought home the puppy which, at the shelter, was quiet, cute, and cuddly. Now that it is home, it yaps nonstop and still isn’t potty-trained after months of trial. It chews up shoes faster than they can be replaced and has taken over the couch. It consumes dog food nonstop. Now that it’s a few months older, it has bitten humans, including those who took it in, on more than one occasion. What’s Nancy to do? Her kids loved the dog, but now that it’s grown, they have moved on to other interests, and now Nancy is left to clean up the messes it creates. She secretly hates the dog but can’t exactly have it put down. This is the lesson you learn when you put the kids in charge of the house.